Tech World: Create your talking picture... Really funny!! If want to create your funny talking picture, then you must visit this online service blabberize. To start just signup or use guest account for logging in and upload any image with visible face. You will se a flash based online tool. In this you needs to locate the mouth of the image. Then record the voice which you want to play on you character and finally save the whole thing. Your blabber is ready to use. Just test this once to make sure that its working fine. You can share or embed this in you web site. They also support integration with facbook. 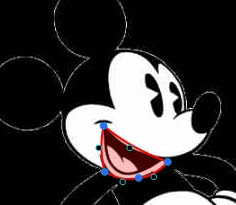 I created one with mickey as a character. see this below (Click on pink button to play). Talking Photos Now you can also create talking photos using this application which allows you to add movie lines and voice to any Facebook photo and share it with friends. Make your pictures talk!